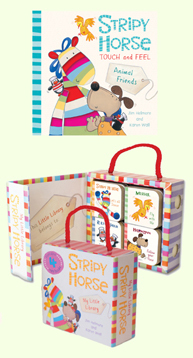 In each of the mini block books you can dance along with Stripy Horse, twist and shake with Roly and Pitch, fly away with Muriel or follow Hermann’s trusty nose… And after you’ve read the books you can stack them like building blocks or put them together to make a little jigsaw on the back! We love it! The little library is published in July- not long now! Looks just fabulous! I do hope it comes out in time for me to send it to my little grandson for his loooooooong flight from Australia in August! 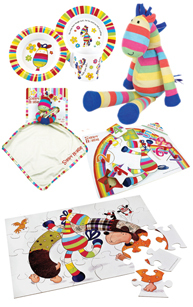 PS Love the idea of the jigsaw on the back. Brilliant! Hi Tia, The library is published in the UK on the 2nd July, so it may just make it! Excellent news! I should just be able to get it to him in time. Jayden loves his Stripy Horse that I took over for him in January. 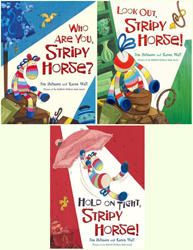 I took Time for Bed too, and knitted a little blue blanket for Stripy Horse, and both go in the cot at bedtime. 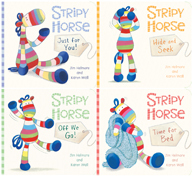 Not sure how much rest poor Stripy Horse gets though ….